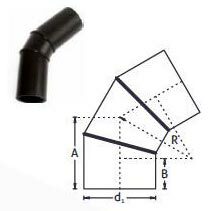 Our PE Buttweld Pipe Fabricated Bends (30, 45, 60 Degree) are specially designed to provide good flow characteristics. We are an eminent Manufacturer and Supplier of PE Buttweld Pipe Fabricated Bend (30, 45,60 Degree). To ensure that only defect free Buttweld Pipe Fabricated Bends (30, 45, 60 Degree) reaches the customer, we carry put stringent quality tests before the final dispatch. Customers can buy the Fabricated Bends (30, 45, 60 Degree) at reasonable rates.